The rain trickles coolly down as we clear ourselves from the cover of the Budapest underground. A crisp air is pressed through my lips turning to visible vapour in the bluing dusk sky. A drip of icy water splashes down on my shoulders and a shiver races up my spine. We’ve been in Budapest for no more than 24 hours and are already beyond impressed. The city is sliced by a beautiful river, it’s dotted with luxuriously intricate architecture, and is home to a population with a cheeky, yet shy, sense of humour. It is even tunneled by a web of caves for the adventurous. But today, as the rains pushes into town aboard the shoulders of an icy wind, I’m starting to feel that pinch of wintry depression claw at my reddening cheeks. 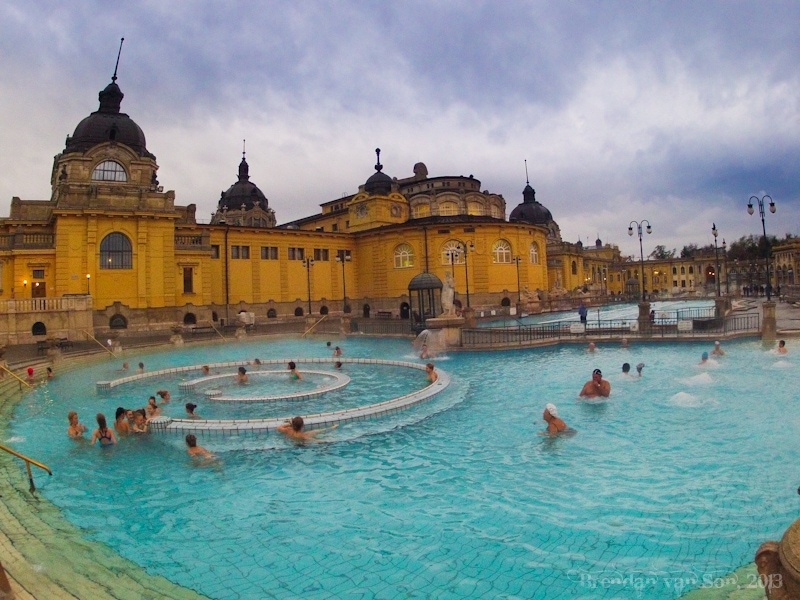 Tiffany’s done her research, as usual, and had Szechenyi Thermal Baths pegged as a “must do” here in Budapest. Under the light misty rain, we approach the pastel yellow building that looks more like a city hall or opera house than it does a hot bath. The lobby of Szechenyi looks like a mix between a public swimming pool and a museum. Intricate stone work stuccoes the walls, an open hall echos voices, and out through the perfectly trimmed windows a massive series of baths steam with warmth. But as we enter the pool area, we realize that this isn’t just a couple spots of water, but a complex of a dozen or so baths. Outside, two pools of warm water shoulder a body of cool blue lanes for swimming lengths. 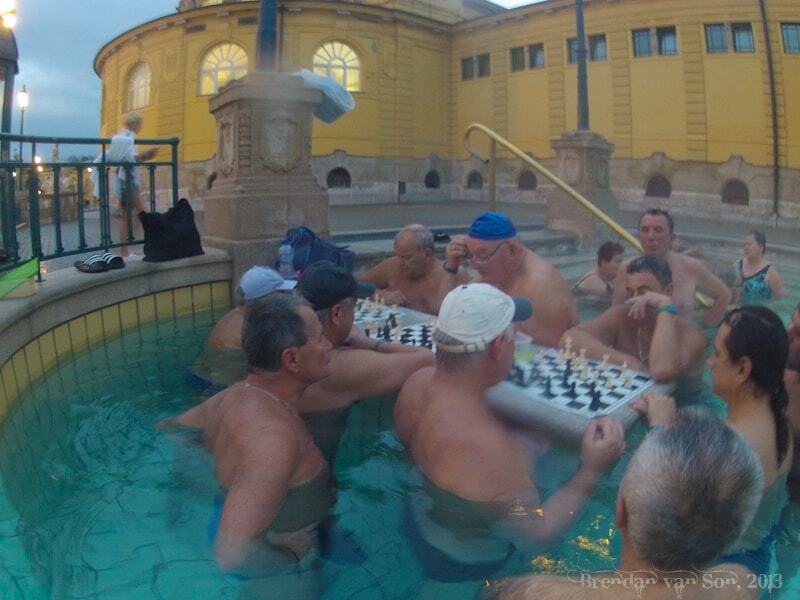 Along the edges of the warm pools, men in speedos and swimming caps with proudly displayed chest hair stand observantly over a game of chess played in the water. Couples float through the center of the pools wrapped around one and other proudly displaying their affections. Streams of powerful water are shot from fountains and men stand with their backs to them indulging in a massage. Inside the building, more pools dot rooms of fine marble and perfect stone pillars. Older couples sit side-by-side without saying a word, relishing the rejuvenating qualities of the aloe vera laced water. Calmly, a middle-aged man waddles out of the pool and directly into a sauna with a sign reading “70-degrees” hanging proudly from the door. We head back outside and again dip ourselves into the warm outdoor bath. I laugh as I read a sign saying the recommended time in the thermal baths is 15 minutes. We must be going on a couple hours now. I look up at the pitch-black sky and feel a drop of cold rain splash down on my forehead. There’s a good chance, they might have to drag me out of this place. I’ll never leave. I always felt my mental image library could be improved with the addition of hairy old men in Speedos playing chess. 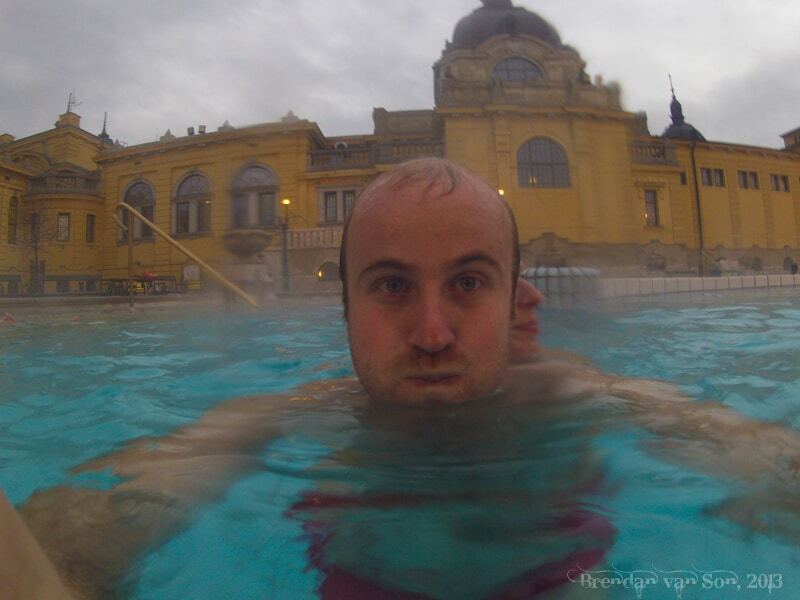 I was in Budapest last week and visiting the Szechenyi Baths was one of the highlights of my time there! I already love hot tubs and mineral baths but this was also such a unique cultural experience and beautiful setting.